Already before the War of the Spanish Succession the Prussian army was far larger than normal for a state the size of Prussia. Investments in the army became so disproportionate that to many observers it seemed that in stead of the army existing to protect the state, the state existed to support the army. The Prussian Cavalry counted 10 regiments fielding about 29 squadrons. The dragoons consisted of 6 regiments with 24 squadrons. 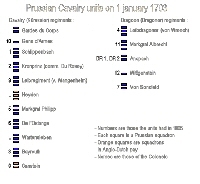 On 1 January 1703 the Prussian infantry consisted of 18 regiments which fielded 33 battalions. The standard infantry regiment had 2 battalions, each with 5 companies of about 150 men. The five regiments hired out to the Anglo-Dutch each had one battalion counting 12 companies of 69 men. The Prussian army furthermore had 17 garrison companies, a construction company, 2 free companies, 2 marine companies and 490 artillerymen. It's said that the militia (Landmiliz) consisted of about 10,000 men in 1704. The origins of the Prussian standing dated from 1620, the year in which the stände allowed Georg Wilhelm (1595/1619-1640) to have a standing army. In 1623 the mobilization of Prussia yielded an army of 10 squadrons and 24 infantry companies totaling about 4,000 men. After the peace of Prague in 1635 this Prussian army was to be expanded to 25,000 men, but it never became more than 11,000 strong. At the death of Elector Georg Wilhelm in 1640 the Prussian army counted 5 infantry regiments totaling 3,600 men and 3 cavalry regiments totaling 2,500 men. Elector Fredrick William the Great (1620/1640-1688) can be called the founding father of the Prussian army. At first he reduced the Prussian army to 2,000 infantry and 200 cavalry, but he soon started to reinforce it. At the battle of Warsaw in 1656 the Prussian army was allied to the Swedish. It brought in 44 infantry companies, 20 cavalry squadrons (40 companies), 10 dragoon squadrons 30 artilllery pieces and 5 Howitzers totaling perhaps 10,400 men. 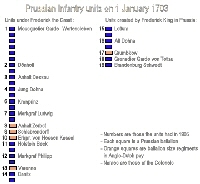 At Frederick the great's death in 1688 the Prussian army had 30 infantry battalions, 32 cavalry squadrons, 28 dragoon squadrons, 13 garrison companies and about 300 artillery men making a total of about 30,000 men. The organisation of these units had been standardized. Each battalion counted four companies of 150 men each, about one third of them pikemen. Each squadron was made of 120 men. As stated the battle of Warsaw in 1656 was one of the first battles fought by this army. Later on Fredrick the Great supported the emperor against the Turks in 1664. In 1672 he was one of the first allies of the Dutch and in this war he got the honor to command the imperial army on the Rhine in 1674 and 1675. In 1675 The Swedes then invaded Brandenburg and were beaten in the battle of Fehrbellin by a Prussian army consisting of cavalry and dragoons. In the winter of 1678-1679 the rest of the Swedes were defeated in the Great Sleigh Drive. Prussia then got lucky when a lot Huguenots fled France. It succeeded in enrolling 500 officers and 1,500 petty officers and soldiers in its army. Fredrick I King in Prussia (1657/1688/1701-1713) thus inherited an a rather sizeable army. He hired out complete regiments which fought in the campaigns of King William, but also sent his troops to the Rhine and to Hungary. This way Prussian troops were present in e.g. the siege of Namur and the battles of Neerwinden, Slankamen and Zenta. During the succession war the Prussian army would grow to 40,000 men. Prussia never succeeded in its attempts to let all its subsidiary troops operate under one banner, which would of course have raised Prussia's prestige. Leopold von Anhalt Dessau during this war started reforms that would make the Prussian infantry the best of Europe. When the end of the war came Friedrich Wilhelm became king. He kept this army intact, even augmented it, and paid for it by having only a very minimal court. For this page I have used: 'Stammliste der Königlich Preusischen Armee seit dem 16ten Jahrhundert bis 1840'.